It was written by the American Beverage Association in response to the barrage of articles condemning sugar-sweetened beverages (SSBs) the New England Journal of Medicine published this past Friday. The articles beat the dead horse that sugar-sweetened beverages contribute to rising weights. 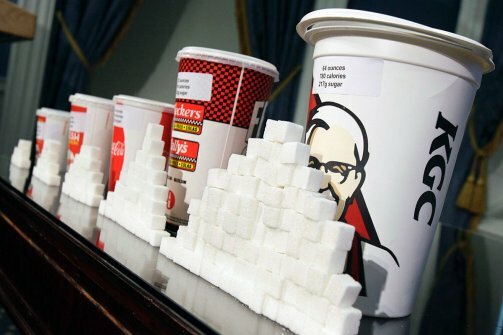 "Sugar-sweetened beverages contribute about 7 percent of the calories in the average American’s diet." And guess what? 7% is a lot! If you lose 7% of your total daily calories you're probably going to either lose weight or gain more slowly. Of course even that's disingenuous as what the ABA doesn't report is that the percentage of sugar-sweetened calories is dramatically higher in teens (as much as 25% of calories coming from sugar sweetened beverages), and moreover, looking at all comers, ignores the fact that there are many folks who don't drink any sugar-sweetened beverages at all meaning that for the actual drinkers, the percentage and/or number of SSB calories they're consuming are likely much, much, higher. What other arguments are trotted out by the ABA to defend the regular consumption of sugar water? 2. Sure, just balance those calories you consumed in all of 3 minutes each day by adding 3.5-7 HOURS of exercise a week. Easy peasy. Really? These are the best arguments the beverage industry's got? If that's the case, I'd say we're getting somewhere! Here's hoping that America's current Surgeon General Regina Benjamin takes this opportunity to grab a page out of C. Everett Koop's shoes and actually take a useful stand on a product that's undermining global health. If for some mind bogglingly bizarre reason you're still on the fence on SSBs and their contribution to weight, why not have a read of the editorial published in NEJM and perhaps the articles themselves (they're free). Remember The Later Cosby Show Seasons? My Favourite Cookbook of the Past Two Years! The Ewe Super High Carb Diet - 99.2% Effective! Lemon Beagle vs. Actual Lemon - Fight!